Dreaming, even if it is not the lucid dreaming when there is no help from the subliminal messages to dream lucid, is something that almost all of us do. But it’s always a blurred sequence of events that we are generally neither able to comprehend nor to rationalize. We don’t seem to have any control on what happens in our dreams or else what direction the events showing up in them are going to take. What if it is possible to do so? Dreaming is basically a process of thinking, with the only difference that during sleep our conscious mind goes unaware; and hence whatever thoughts appear on the screen of our awareness are those initiated as well as finalized by our unconscious mind alone. The unconscious thoughts are always chaotic, making no sense to the rational mind that works only at the conscious level. It is so because the unconscious thoughts are always kept repressed by the censoring faculty of the mind. During sleep when the censoring faculty has gone inactive, the repressed thoughts start showing clear pictures on the slate of awareness; but since they were kept repressed for long, they have forgotten how to express themselves rationally. How to induce lucid dreaming? If you want your dreams to go rational and lucid, you need to plant a seed for one before you have gone to sleep deep and sound. Subliminal messages plant such seeds through suggestions into your subconscious mind. These subtle messages not only make your dream lucid but also let you remember those dreams in their total vividness. Exploring your dream world in such a clear manner imparts you with an insight into your unconscious drives, so that you can make peace with them and use their energy in more productive ways than just keeping them repressed, wasting their energy as well as of the censoring faculty that keeps them repressed. 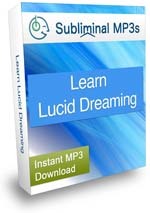 Start today with lucid dreaming subliminals if you are really serious about it.